On December 11, in response to the growing humanitarian crisis in Yemen, more than 50 concerned people including representatives of various peace, justice and human rights organizations and communities, gathered in New York City’s Ralph Bunche Park, across First Avenue from the United Nations. Our message, which was communicated on signs and banners and by speakers addressing the rally, was simple and direct: end the war crimes being committed by the military of the United States along with Saudi Arabia and its coalition partners abetted by the US and end the blockade of Yemeni ports. For more than two years, Saudi/US bombing has targeted civilian infrastructure: Hospitals, schools, factories, markets, funerals, sea ports, electrical power stations and water treatment facilities. 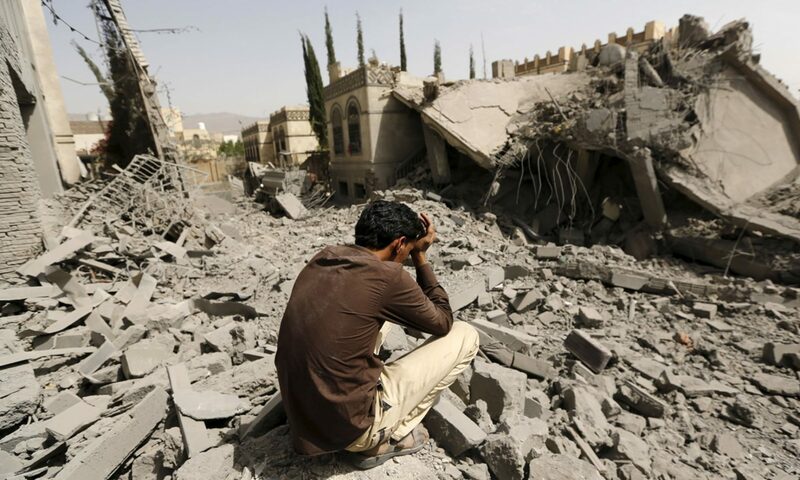 US drones strikes and incursions by US Special Forces into Yemen have killed civilians as well. Armed conflict has directly taken the lives of some 12,000 people, but that tragic number is greatly exceeded by the number of those who are dying from a combination of malnutrition and otherwise easily preventable ailments and diseases like respiratory infections, measles, and cholera, including more than 1,000 children each week. 20 million of Yemen’s population of 28 million people are food insecure and few have access to clean drinking water. More than half of the hospitals in the country are not functioning. On November 27, limited exceptions to the blockade were made for humanitarian aid shipments alone. The resulting tightly controlled deliveries have been decried as an empty and vastly insufficient gesture by humanitarian aid groups, who are calling for the ports to be opened to all humanitarian and commercial shipments. Under this pressure, President Trump issued a very brief statement calling upon the Saudis to “completely allow food, fuel, water and medicine to reach the Yemeni people who desperately need it.” Trump’s uncharacteristically polite request was not backed by anything much at all, much less by a freezing of US arms sales to the Saudis, nor did it address the practice of the US Air Force refueling Saudi fighter jets in mid-air or the US’ own drone strikes in Yemen. After speeches, songs and a powerful minute of silence, the rally moved up First Avenue to both the US and the Saudi Permanent Missions to the United Nations, led by banner reading “STOP US-SAUDI WAR CRIMES” and “LIFT THE BLOCKADE”, followed closely by officers of the New York City Police Department. Some of us felt compelled by conscience to stand in the doorway of the US Mission and after a short time, we were arrested for violating the “obstructing vehicular or pedestrian traffic” provision of the New York Penal Law regarding disorderly conduct. 15 of us, carrying photos of Yemeni child victims, were taken into custody and transported to the cells of the 7th Precinct on the city’s Lower East Side. The blockade of Yemen is an atrocious crime of the highest category, a violation of the United Nations Charter and the Universal Declaration of Human Rights and other international pacts. The US participation in the war on Yemen is a violation of the war powers provisions of the United States Constitution, at the very least. The imposition of our modest “blockade” of the United States Permanent Mission to the United Nations, in contrast, threatened no one. No one got sick or died because we stood in that doorway. In New York State, disorderly conduct is a violation, not even considered a crime at all. Still, the NYPD choose to ignore murder committed on its beat and to expend its prodigious resources to arrest and to prosecute law abiding citizens who demand an end to the crimes against Yemen. Thank you, dear, for the article. Hope you got on the plane without your proper ID. Alice, Helga, Bernice and I were cellmates inspiring each other with past civil disobedience stories for 8 hours in Precint #7 in the lower East side.